I remember the first Christmas break after my freshman year in college. My high school friends and I had just seen each other at Thanksgiving. Everything had been fantastic — lots of reminiscing as well as catching up, laughing about someone sporting a new beard or talk about who was still liking who. Yet something had changed. We had more time to be together but there was less to talk about. Just how many times could you tell the same funny story? Maybe a handful of us still felt close. But the vast majority? Not really. Friendships. Some abide through thick and thin. No matter what happens in your life, no matter if you go through a time when you are not all that easy to like — that friend is sticking around. These are the friends that will tell you the truth even when it hurts. And you know that when and wherever they needed you, you’d be there, no questions asked. And vice versa. These kinds of friends are of unmeasurable value. But other friendships friendships don’t endure. Perhaps the friendship doesn’t survive losing the context of how it began. Maybe it dwindles because both of you change in some way and the fit isn’t as tight or comfortable as it used to be. Or maybe one of you slams the door and walks out of the friendship, either in anger and hurt or, perhaps more jarringly, for no apparent reason at all. A few years ago I read a wonderful anthology about female friendships, My Other Ex: Women’s True Stories of Leaving and Losing Friends, compiled by Jessica Smock and Stephanie Sprenger. It features essays by both women who found themselves abandoned by a once-treasured friend, as well as the women who ended the friendships. I was more than eager to read it. Because it had happened to me. I had had a very good friend end our 35 year-old friendship. We’d laughed over the years that we’d be together in our rockers, me at 90 and her 91 (always an important detail…), cussing like sailors because we couldn’t hear each other. I have many wonderful memories of the years of friendship that I thought would last a lifetime. 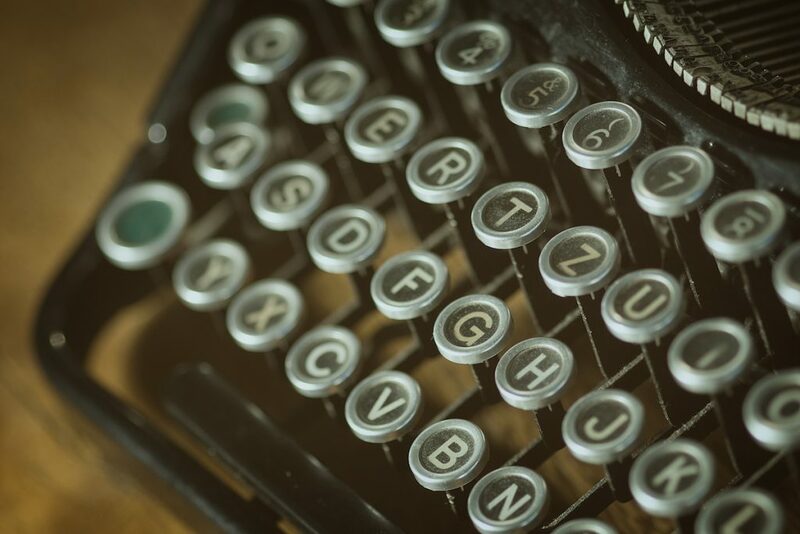 My kindred spirit opted out with no explanation other than, “I (meaning her) am a bad person.” She’s not a bad person so I, like many of the writers featured in the book, was left to sop up the remains of my heart that felt as if had burst all over the floor. I felt like I must have been a terrible friend. I traced over and over our past, trying to find the first sign that she had been backing off. 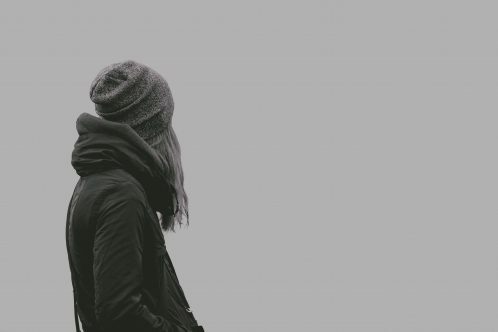 And over the next year or so and after a couple of embarrassingly out of control, angry and pleading phone calls, I emotionally divorced her as well and stopped shaming myself for something that I couldn’t even define. The whole thing remains a mystery to me, but so be it. I spent some time wondering what other relationships might disappear on me, but that didn’t last long. And I chose to deepen other friendships that I had made much later in my life, relationships that now more than qualify for visions of their own rocking chairs. I was intrigued to read what others had to say on the topic. What I found was more comprehension, more perspective of both my friend and me. It was a wise choice on the editors’ part to include stories on each side of the dynamic; as you travel from one story to the next, you hear the pain of being either person. You can feel the self-doubt and confusion of the one left behind as well as the guilt of the one choosing to go. And you can begin to piece together what might have always existed in the friendship that had always had the potential to lead to its demise. Or you can see where the love that was so bright at one time had simply weakened in its intensity until it disappeared. And so the end. Both of you need to move on. Fear or anger or sadness or distrust or hurt can keep you stuck. 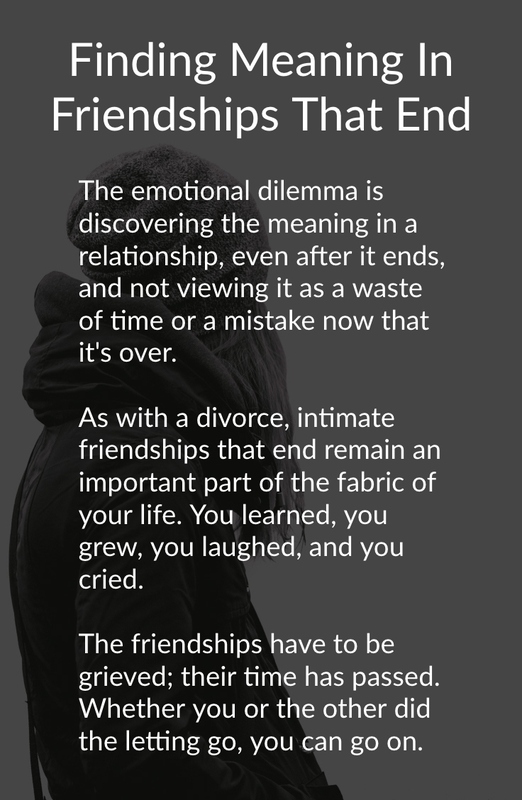 The emotional dilemma seems to be discovering the meaning in a relationship, even after it ends, and not viewing it as a waste of time or a mistake now that it’s over. As with a divorce, intimate friendships that end remain an important part of the fabric of your life. You learned, you grew, you laughed, and you cried. The challenge is to not allow the anger or shame or guilt you may feel in the wake of the parting of ways to demean what the relationship meant in your life. And as in divorce, you can likely find those who would be willing to vilify your now ex friend. And it’s important for that not to happen. You can certainly be open to hearing what other trusted friends views are. Maybe they saw something you didn’t see. But she (or he) was your friend a long time. It was intriguing to learn that many of the friendships described in the book were reconciled after the story was told. Perhaps that’s a statement about the idea that time can heal, or that misperception and misunderstanding can be resolved with responsible effort and sincerity. Other friendships that have been lost won’t have that chance. They have to be grieved; their time has passed. Whether you or the other did the letting go, you can go on. 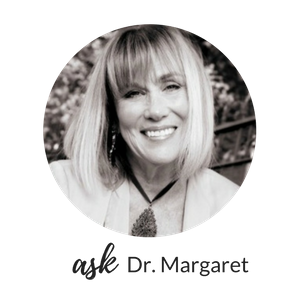 You can now listen to Dr. Margaret as she talks about Perfectly Hidden Depression and many other topics on her new podcast, SelfWork with Dr. Margaret Rutherford. Click here! You can also subscribe to her website, and join the over 4000 readers who enjoy receiving her weekly posts via email! For joining, you’ll receive a free copy of her ebook, “Seven Commandments of Good Therapy,” a guide to evaluating a therapist. This post originally seen on Midlife Boulevard and was first published here on June 8, 2015 and was updated on November 17, 2018.